Home Itchyworms Viber ViberPH releases Itchyworms Lost in Space sticker pack! 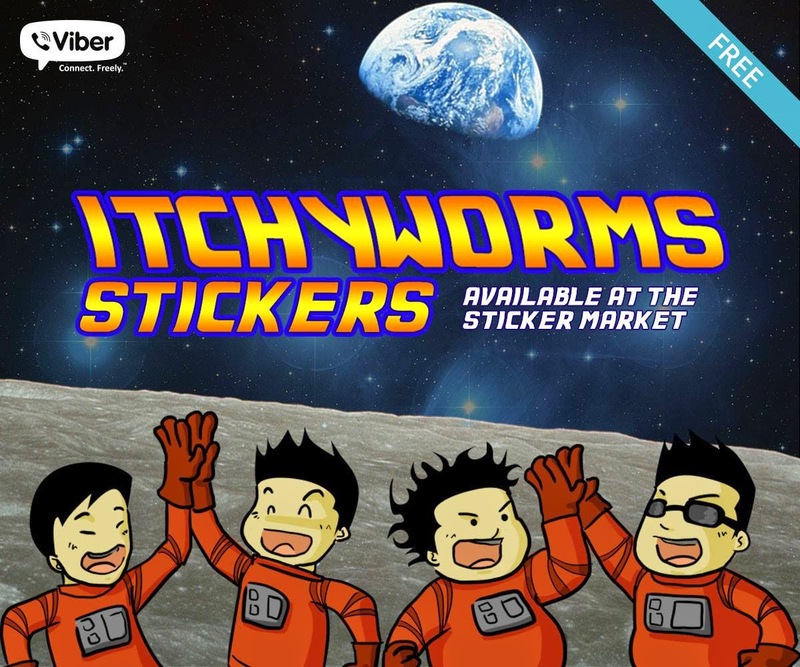 ViberPH releases Itchyworms Lost in Space sticker pack! Yesterday, July 29, 2014 at Route 196 in Quezon City. Viber Philippines and the worry-free, witty guys of the band Itchyworms marked a special collaboration release of Viber stickers dubbed as The Itchyworms: Lost in Space sticker pack! During this presscon/gig Itchyworms members Jugs Jugueta, Jazz Nicolas, Chino Singson, and Kelvin Yu, willingly answered questions from the bloggers regarding these first of its kinds tie-up between two groups. One from the smartphone messaging app developer, Viber and the countries fun-to-watch & successful band Itchyworms. The latter also revealed that they've been making fans happy and OPM music alive for 18 years now. The Itchyworms: Lost in Space stickers are somewhat like emoticons you see on other Internet-based messaging apps. But, these Viber stickers still more lovable and addicting to use, as they are more colorful, personalized and has the Pinoy touch in it! Itchyworms revealed that these Lost in Space stickers or #ItchyVibe stickers are not only based from the album art of their latest released compilation album After All This Time. These are the bands' expressions that they actually use even before these stickers were born. The best of it all, Viber's Itchyworms: Lost in Space stickers pack is free to download and use. There are 40 different Itchyworms-inspired stickers to choose from and you can use them to simply show your Viber friends how you feel, w/o saying a word(in text). The band confessed that they've been Viber users all this time. They use Viber to talk about their gigs, or vote for something that they need to decide as a group. According to the group, Viber has become Itchyworms main means of communication if their skeds won't meet. Group messaging in Viber has been an important tool for them. Unlike before, one of them needs to sms each member just to get a majority of votes or inputs ( for a critical decision they have to make) from the rest. With Viber's group messaging feature they can easily exchange ideas. So why did Viber Philippines choose Itchyworms? “We wanted a Filipino band to work with us on creating a sticker pack for barkadas. Itchyworms fit the brand and the stickers they shared were exactly what we were looking for–something fun that friends will use. They embody the spirit of fun, cool and easy going,” Viber Philippines Country Manager Crystal Lee said. The Itchyworms are equally happy to partner with Viber. “We're so proud to say that we are the first Pinoy band to get a Viber sticker pack, and it's really quite surreal. We're just so happy and excited for all the kids and the not-so-kids to start using the #ItchyVibe stickers,” Itchyworms co-lead vocalist Jugs Jugueta shared. “It was serendipity,” he added. Yes a perfect match was then made. How did #ItchyVibe slash Itchyworms: Lost in Space stickers start? As the cliche goes, the rest is history!